European governments and Jewish groups were on Tuesday preparing to face a possible surge in anti-Semitic violence as Israel's offensive in Gaza sparked protests. France, home to Europe's biggest Arab and Jewish populations, fears further attacks after a gang rammed a car into a gate outside a synagogue in the southern city of Toulouse late Monday and set it on fire. No-one was hurt, but the incident revived memories of a sharp spike in anti-Semitic crimes in 2002, against the backdrop of earlier fighting between Israel and the Palestinians. President Nicolas Sarkozy, who was touring the Middle East to seek support for a new Gaza ceasefire, issued a statement condemning the attack. "The President of the Republic believes that our country will not tolerate international tension mutating into inter-community violence," he warned. Sarkozy called for France to unite behind his drive for peace, dubbing this the "only possible response and dignified attitude for our country faced with the tragic circumstances in the Middle East." Interior Minister Michele Alliot-Marie sent a letter to regional security chiefs warning them that evidence had emerged that "groups or individuals may be trying to exploit the situation. "Everything must be put in place to avert this risk and protect the principles that ensure national unity," she said. In neighboring Belgium, a government spokesman said security forces were taking precautions as street protests against Israel's campaign in Gaza grow in size and in anger. "We note that the situation is becoming more explosive," he said, even as police reported that a gang had attempted to set fire to the door of a Brussels synagogue using paper and petrol as accelerants. 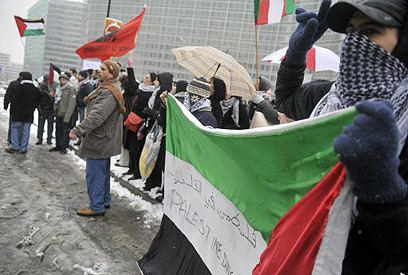 Scuffles broke out last week following a pro-Palestinian march in the Belgium port city of Antwerp, which has large Jewish and Muslim communities. On Tuesday, leaders from both camps issued a joint appeal for calm. "The Jews and Muslims of Antwerp do not share the same views on what is happening in the Middle East, but that is no reason to bring the conflict here. We are all Antwerpers, Flemish, Belgian and neighbors," it said. Across the Channel in Britain, a spokesman for a group that monitors anti-Semitism said violence against Jews and their property was running at four times the normal level for the time of year since the Gaza campaign began. "Over the last week, we've now seen over 20, perhaps 25, anti-Semitic incidents that appear to be related to the violence in Gaza and southern Israel ," said Mark Gardner of the Community Security Trust. France is home to millions of Muslims and Jews, who often live alongside one another in the suburbs of major cities. Street demonstrations against the war have begun to trigger outbreaks of violence. On Saturday, a mob of protesters burned cars and looted Paris jewelers. At some point last week vandals also smashed part of the Wall for Peace sculpture in the garden opposite the Eiffel Tower, targeting a panel marked "Shalom" and "Salaam", the Hebrew and Arabic words for peace. Also since the start of the Gaza fighting, a cedar tree planted in memory of the late Israeli Prime Minister Yitzhak Rabin in the French city of Lyon was damaged by a vandal armed with a saw, police said. The Union of Jewish Students in France has recorded two attacks on kosher stores in southwestern Bordeaux, one on a Jewish apartment in Paris and another on a synagogue in southern Toulon since New Year's Eve. "We must not allow the Middle East conflict to shatter our lives together," the group warned in a statement. France's National Bureau of Vigilance Against Anti-Semitism also raised the alarm over an attack on a rabbi's car near Paris last week, as well as a spike in "menacing" anti-Jewish posts in French internet chatrooms. Meanwhile, British newspaper the Daily Telegraph reported Wednesday of a recent rise in anti-Semitic incidents in the UK as well. A report published by the Community Security Trust, which gives safety advice to British Jews, said there had been 24 incidents since December 29, including an arson attack on a synagogue in London. A spokesman for the group, Mark Gardner said: "There has been a significant rise in the number of anti-Semitic incidents, especially when compared with what is usually a very quiet time of year for racist, anti-Jewish attacks. "It is a pattern with which we and the police are now sadly familiar, whereby hysteria is whipped up against Israel, and British Jews then suffer a wave of anti-Semitism," he told Sky News. See all talkbacks "Europe fears spike in anti-Semitism over Gaza"